instills in him/her a sense of pride for the institution. Striped White And Blue Shirt with logo of Chandigarh Administration,Navy BluePant/ Half Pants, Navy Blue Patka (For Those Who Use) Black Shoes, Blue shocks, belt with white and blue strip. Striped White And Blue Shirt with logo of Chandigarh Administration, Navy Blue Tunic, Blue Hair Band Or Navy Blue Ribbons Black Shoes, Blue shocks, belt with white and blue strip. Striped White And Blue Shirt with logo of Chandigarh Administration,Navy Blue Pant, Navy- Blue Patka (For Those Who Use) Black Shoes, Blue shocks, belt with white and blue strip. 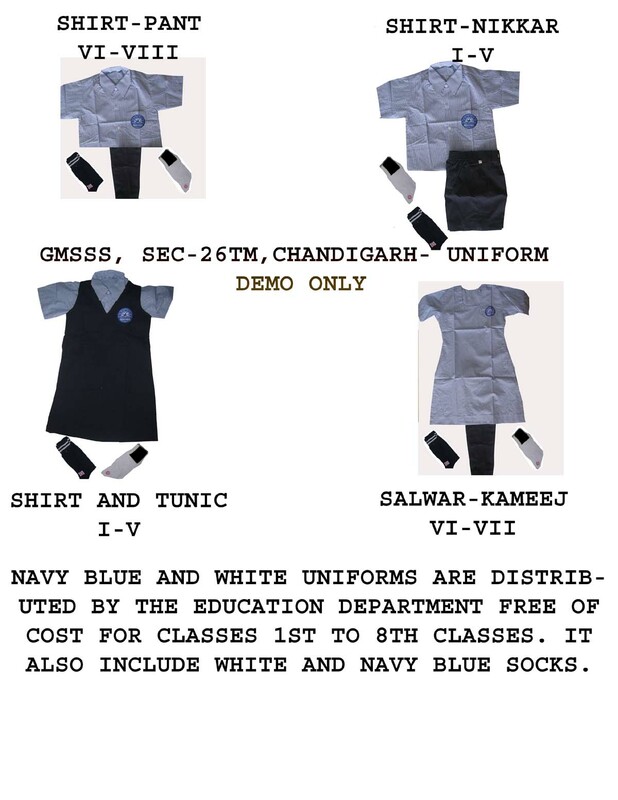 Striped White And Blue Kameez,Navy Blue Salwar , blue Hair Band( Striped White And Blue Shirt with logo of Chandigarh Administration, Navy Blue Tunic) or Navy Blue Ribbons Black Shoes, Blue shocks, belt with white and blue strip. Striped White And Blue Shirt with logo of Chandigarh Administration,Navy Blue Pant, Navy- Blue Patka (For Those Who Use) Black Shoes, Blue shocks, belt with white and blue strip . Striped White And Blue Kameez,Navy Blue Salwar , blue Hair Band Or Navy Blue Ribbons Black Shoes, Blue shocks, belt with white and blue.